RIO DE JANEIRO, BRAZIL – Although May 1st is still a few days away, many of those living in Rio have already made their way out of town to make the most of the public holiday – O Dia do Trabalhador, also known as May Day or International Workers’ Day. Many people will be turning Tuesday’s day-off into a “feriadão” – an extra-long holiday weekend. Heavy traffic is expected to be accompanied by heavy rains this holiday weekend, image recreation. 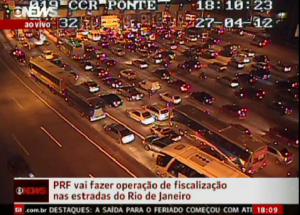 By Friday morning, many of the major roads out of Rio were predictably experiencing high levels of traffic, with the BR-101 highway already gridlocked and a serious accident on the Rio-Niterói bridge making the already-congested route even worse. But those staying in Rio are not set to have a much more enjoyable time, as weather forecasters at Inmet (Brazil’s National Institute of Meteorology) have predicted deluges and cool temperatures for Rio over the holiday weekend, and the city has been put on alert for heavy rain. A cold front off the coast meant Friday was particularly rainy and overcast, but forecasters said sunny spells should break through some of the cloud on Saturday. However, those hoping for a sunny weekend will likely be left disappointed: Sunday is set to be the worst of the three days, with a mixture of thunderstorms and heavy rain, thanks to an area of low pressure pushing up from Argentina. This means the southern states and São Paulo will not likely fare any better. Good heavans another 4 day weeking. Wasn’t there on just last week?